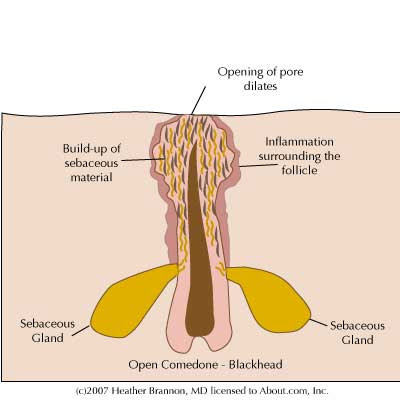 Blackheads are caused by excess oil deposited on skin by glands, dead skin, bacteria or dust. The pores get blocked by excess oil which hardens the pore. The exposed surface of the pore turns black and plugs deep inside the pore. These tiny blackspots becomes very hard to be removed and look ugly. Blackheads can be easily treated from homemade remedies which are economical and easily available. Here, I mention some effective blackhead removal methods from kitchen and garden materials. • Make a paste of multani mitti (Fuller’s earth) along with rose water. Apply this paste and wash after drying. This reduces blackheads. • Make a paste of almond powder, glycerine and multani mitti and apply over blackheads. • Applying cucumber juice all over face, using a piece of cotton refreshes skin and reduces blackheads. • Apply sandalwood powder along with rose water on blackhead area and wash after 15 minutes. This reduces blackheads on regular usage. • Green tea leaves act as an effective facial scrub. • Applying turmeric and coriander leaves paste works well with blackheads. Please note a few rules to avoid occurrence of blackheads and to have a healthy blackhead free skin. • Do not squeeze blackheads as it causes infections. • Never keep your skin oily. Use a mild soap or face wash and have an oil-free skin. • Use cleansers to keep away dirt. • Avoid too much makeup. Try to keep your skin free from cosmetics so that it can breathe. • Use warm water to wash your face which opens up pores and allows blackheads to fall off. • Use facial tissues when you are in an outing to clean your face and avoid sharing towels. I hope sharing this information benefits all the ladies here. Image Sources: 1, 2, 3, 4.
:thumbsup: :thumbsup: :teddy: :teddy: :teddy: Nice article,Meghana! Very useful!